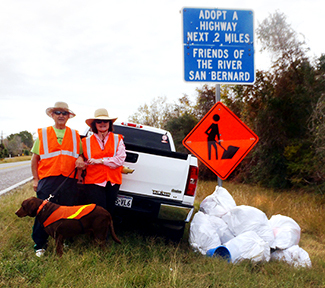 Four hardworking volunteers, Nick and Barbara Fratila and Bob and Susan Bailey, collected eleven bags of trash along FM 2611, near the Churchill Bridge, on Saturday, December 3. Four-legged volunteer, Hershey, lent his sniffing abilities to the job. Additional volunteers are needed to help pick up trash along this stretch of road, done four times a year. Help keep the San Bernard looking good!